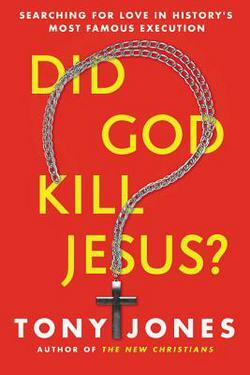 It takes 234 pages for Tony Jones to answer the central question in his new book, Did God Kill Jesus? The author is a self-described “theological provocateur,” so the question posed in his book should not surprise anyone. The answer that emerges on page 234 is crystal clear: “No, God did not kill Jesus,” says Dr. Jones. Readers will find that the path to this answer is paved with doubt and skepticism. Frankly, it is a path fraught with theological compromise. Tony Jones has a knack for asking questions. He has an uncanny ability of questioning the theological status quo and forcing readers to decide, even re-evaluate their cherished views. Unfortunately, some of the answers that Jones provides do not match the biblical record or pass the test of orthodoxy. What does the model say about God? What does it say about Jesus? What does the model say about the relationship between God and Jesus? How does it make sense of violence? What does it mean for us spiritually? Ultimately, none of the theories fully satisfy the author. But the one he finds the most repugnant is penal substitutionary atonement. Jones argues that this view, which he labels the payment model is currently in vogue “largely because it appeals to our sense of justice and our understanding of law and penalties.” And he is not particularly bashful about how he feels about penal substitutionary atonement. In his previous book, A Better Atonement: Beyond the Depraved Doctrine of Original Sin, Jones writes, “I’m on no quest to reject the penal substitutionary theory of the atonement (PSA). (I merely intend to dethrone it).” However, what he fails to see is this: when penal substitutionary atonement is dethroned, the gospel of Jesus Christ is thrown into the ash heap and the hope of every person perishes. Jones caricatures the doctrine of penal substitutionary atonement by placing God the Father in an untenable position by “sending his perfect Son to Earth, then letting him – or making him – die as a substitute for the billions of human beings past and future who are incapable of paying off the debt incurred by their sin. That’s the Payment model” according to Tony Jones. The biggest disappointment in this book is the repudiation of penal substitutionary atonement, the doctrine which contains the very core of the gospel message. As noted above, the path which leads to the ultimate question in the book is riddled with “rocks” and “weeds” and “branches” that careful readers should navigate in order to understand the position the author takes. Two of these stumbling blocks are noted below. A.W. Tozer was certainly on target when he wrote, “What we think about God is the most important thing about us.” Yet what we find here is a view that has much in common with process theology. The author writes, “… We can surmise that in Jesus, God was learning.” He continues, “But on the cross, something else happened altogether, possibly something that even God did not expect.” The implication here appears to be a compromise of God’s comprehensive omniscience, a troubling turn of events to be sure. A “tough pill” to swallow? You bet! Discerning readers would do well to keep that “pill” out of their mouths, especially when the testimony of Scripture points to a God who is all-together sovereign and omnipotent over everything and everyone in the cosmos. Swallow such a “pill” will leave readers spiritually sick. Yet, when one reduces the cross to a mere display of love and refuses to acknowledge that Jesus bore the wrath of God, the gospel is utterly stripped of its saving power. Such a move is to destroy the very heart of the atonement. In the final analysis, the answer to the question of this book is not a simple yes or no answer. The Scripture makes it plain that both God and man killed Jesus Christ. This is a book that should upset a lot of people. Frankly, I’m glad Jones wrote the book because it will rally conservatives around the truth of the gospel. This book should motivate pastors and scholars to go deeper into the reality of the gospel and prompt God-centered reverence and worship as they glory in the beauty of penal substitutionary atonement. Evangelicals need to pay careful attention to books like this that grow more and more popular. Jones urges readers to participate in what he calls, “the smell test.” Unfortunately, something doesn’t smell right about this book. Readers are encouraged to explore the God-honoring doctrine of penal substitutionary atonement in three powerful and provocative books which include: The Apostolic Preaching of the Cross – Leon Morris, Pierced For Our Transgressions – Steve Jeffery, Michael Ovey, Andrew Sach, and It is Well: Expositions on Substitutionary Atonement – Mark Dever and Michael Lawrence. I’m finding more and more people are looking at the atonement now. I just read a review, one that supported Brian Zahnd’s view, that God did not kill Jesus, the Romans did, unjustly, and therefore God’s love through Jesus’ death is our forgiveness of sins. I am appalled at this new neoliberalism. How does God’s love and forgiveness come to us through a human killing of Jesus only? This is where I am perplexed with their arguments today. Anyway, I digress. I enjoyed your article and hope that you will look at my site as well: http://www.beardedtheology.wordpress.com thanks, have a a great day. Thanks, sir. I’ll check it out! Thanks for the kind words, John. I appreciate the encouragement!